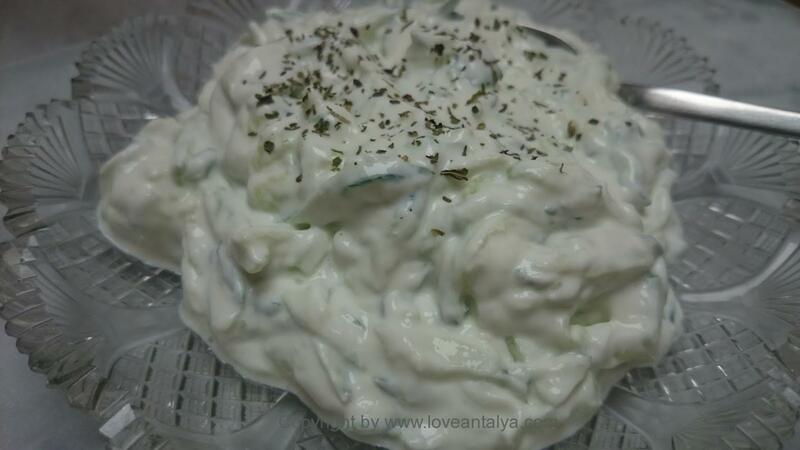 Home » English » Cacik or tzatziki – what do you prefer ?? Because it is in fact two sides of the same coin, as it states cacik or tzatziki depends on, whether it is respectively Turkish or Greek. Once I thought, that it of course was the Greeks, who had the “copyright” for this dish. When I was “Turk-ified” I obviously have since thought, that it was Turkish and that the difference was, that the Greeks sometimes uses dill (although Turks also can find it), and the Turks rather spend a little dried mint. But it’s apparently not quite as easy as that. It’s all mixed well together, and if you investigate a little, you can find cacik across the Middle East, just with slight variations. But the word had come from the Armenian “cacig“. Well, but the origin doesn’t really matter, the main thing is, that it tastes super good on a hot summer day together with ex. lamb, kebabs of different kinds (ie grilled meat on skewers), Köfte or just with a little toasted pita bread. At my brother in laws cacik is especially used together with lasagne, then one must say, that it goes as accessories for the most. Cacik is phenomenal to bring to a picnic or as a part of a meze table (where there is served several small dishes together, all used as starters, but can also be used for lunch or to a light main course). You have probably made cacik to an unconsciousness state and there is really no bone in it. 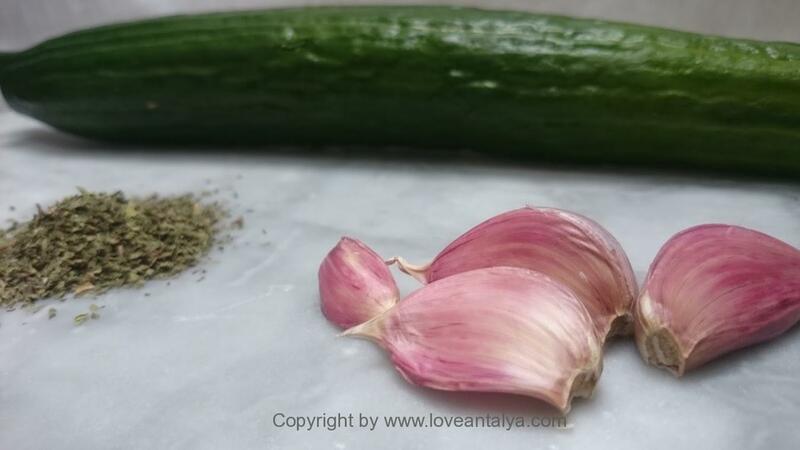 Basically you just tear some cucumbers, squeeze or tear a few cloves of garlic, mix it with youghurten, mix the cucumbers into the yogurt / garlic mixture and finally – just before serving – seasoning with salt and a little pepper and maybe a little dried mint or dill. Bum – see – it’s not so difficult. – you tear the cucumbers coarsely, mix them with a little salt and let them drain in a colander for about 30 minutes, so that the worst of the moisture is out before you mix the cucumbers with the youghurt. I mostly use this method. – You choose whether cucumbers must be peeled or not. I almost never do it, for all the vitamins are in the peel, but when we are in Turkey, I do it because …. Yes I do…. (Cucumber down there often have little thicker shell and some varieties are very bitter – that I do not want to have in a mild and good “salad”). – You may choose to drain the youghurt through a clean tea towel (or a piece of cheesecloth for the more advanced – it has often finer meshes and you can just throw the cloth out afterwards). I personally think, that there isn’t much difference whether the youghurt is drained or not, so I generally don’t. But ok – with my arm twisted around my back, then this version may be slightly creamier than the other. But again – not as significant a difference, that I think it is worth the hassle. – The most difficult you can do – and the salad is said to be the best, is to tear the cucumbers and let them drain overnight (or eg. From morning to evening). Mix the youghurt and garlic and place the mixture in the refrigerator, so that it can stand and draw. Garlic gaining strength, the longer it is allowed to drag, but it is supposedly not getting the sharp aftertaste, as when you make the quick version and just presses the garlic in just before serving. Mix the youghurt and the cucumbers and season with salt, dill or mint just before serving. – Or maybe you have some tricks I do not know (as so I would love to hear about it). But honestly – it’s as easy as that, and this is nice sometimes. Whether you use Turkish or Greek yogurt is also not much a difference – and you’re not going to talk to it (both languages is probably equally impossible ??). 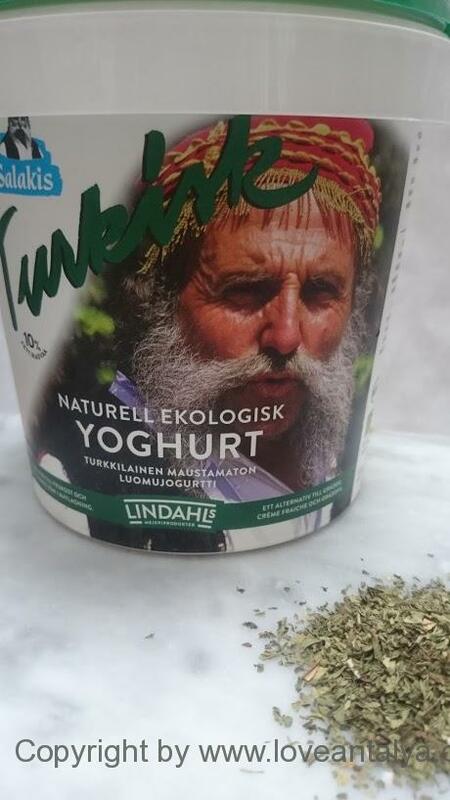 I am told that in several places in Greece, the is a “risk” of getting a tzatziki made of youghurt from goat or sheep. It sounds real enough, the regions considered, and if you like it, then it’s great. As you vaguely might sense, I am not a big fan. Whether you add ex. 2 tablespoons good olive oil, 1 tablespoon white wine vinegar or lemon and dill, parsley or mint must stand for your own expense. But it can be done and tastes really nice. I apologize in advance the not too good pictures – I got to get some new, next time we have cacik home. 01/07/2016 | Kommentarer lukket til Cacik or tzatziki – what do you prefer ? ?